The Yankees announced on Saturday night that they traded relievers Chasen Shreve and Giovanny Gallegos to the St. Louis Cardinals for right-handed hitting 1B Luke Voit and international signing bonus pool money. 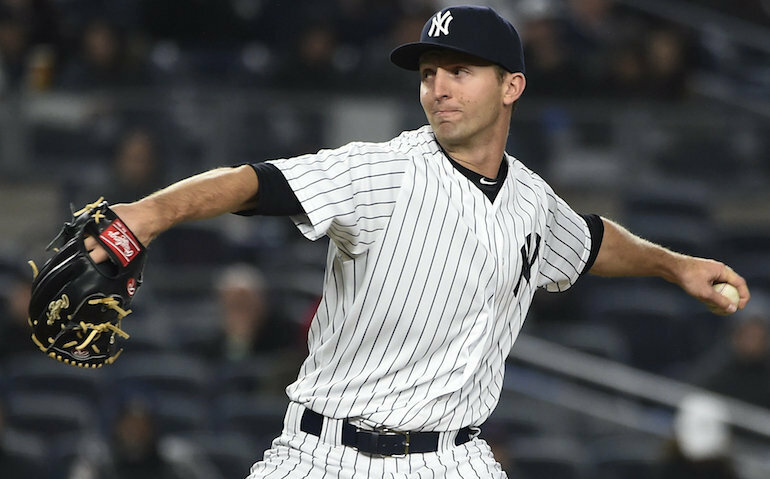 When the Yankees acquired Zach Britton from Baltimore last Tuesday, taking the role as the second left-hander in the Yankees bullpen with closer Aroldis Chapman, it was inevitable that they would move Shreve. Shreve, 28, went 2-2 with one save (last Saturday against the Mets) and a 4.26 ERA (38.0IP, 39H, 23R/18ER, 18BB, 46K, 8HR) in 40 relief appearances this season. The Las Vegas native has spent the last four seasons with the Yankees (2015-18), combining to go 14-6 with two saves and a 3.92 ERA (174.2IP, 152H, 83R/76ER, 89BB, 201K, 34HR) in 180 relief appearances. He was acquired by the Yankees with RHP David Carpenter from the Atlanta Braves in exchange for LHP Manny Banuelos on January 1, 2015. Voit, 27, appeared in eight games for the Cardinals this season, hitting .182 (2-for-11) with 2R, 1HR, 3RBI and 2BB. He has spent the majority of the season in the minors, combining with Triple-A Memphis (67G) and Double-A Springfield (2G) to bat .300 (72-for-240) with 36R, 16 doubles, 2 triples, 10HR, 37RBI, 32BB, a .392 OBP and a .900 OPS in 69 games. In 546 career minor league games, Voit owns a .288 (562-for-1,953) batting average with 264R, 105 doubles, 18 triples, 64HR, 305RBI, 229BB, a .370 OBP and an .828 OPS. A native of Wildwood, Mo., he was originally selected by the Kansas City Royals in the 32nd round of the 2009 First-Year Player Draft before electing to go to college at Missouri State University. He was later drafted by the Cardinals in the 22nd round of the 2013 First-Year Player Draft to begin his professional career. Gallegos, 26, posted one save and a 4.50 ERA (10.0IP, 5ER) in four relief appearances with the Yankees this season. He has spent the majority of the season with Triple-A Scranton/Wilkes-Barre, where he went 2-1 with two saves, a 3.90 ERA (27.2IP, 12ER) and 41K. He was originally signed by the Yankees as a non-drafted free agent on January 6, 2011, and made his Major League debut with the club in 2017.